Billy Joe "B.J." Thomas (born August 7, 1942) is an American popular singer. He is particularly known for his hit songs of the 1960s and 1970s, which appeared on the pop, country, and Christian music charts. His best-known recording is the Burt Bacharach/Hal David song "Raindrops Keep Fallin' on My Head". Thomas was raised in and around Houston, Texas, graduating from Lamar Consolidated High School in Rosenberg. Before his solo career, he sang in a church choir as a teenager, then joined the musical group The Triumphs. During his senior year he made friends with Roy Head of Roy Head and The Traits. The Traits and the Triumphs held several Battle of the Bands events in the early 1960s. In 1966, B.J. Thomas and The Triumphs released the album I'm So Lonesome I Could Cry (Pacemaker Records). It featured a hit cover of the Hank Williams song "I'm So Lonesome I Could Cry". The single sold over one million copies and was awarded a gold disc. The follow-up single, "Mama", peaked at No. 22. In the same year, Thomas released a solo album of the same name on the Scepter Records label. Thomas came back to achieve mainstream success again in 1968, first with "The Eyes of a New York Woman", then five months later with the much bigger "Hooked on a Feeling", which featured the sound of Reggie Young's electric sitar and was first released on the album On My Way (Scepter Records). "Hooked on a Feeling" became Thomas's second million-selling record. A year later Butch Cassidy and the Sundance Kid featured Thomas performing the Bacharach/David song "Raindrops Keep Fallin' on My Head", which won the Academy Award for best original song that year and hit No. 1 on the Billboard Hot 100 in January 1970. Sales of it also exceeded one million copies, with Thomas being awarded his third gold record. The song was also released on an album of the same name. Other hits of the 1970s were "Everybody's Out of Town", "I Just Can't Help Believing" (No. 9 in 1970, covered by Elvis Presley), "No Love at All", "Mighty Clouds of Joy", and "Rock and Roll Lullaby". Thomas's earlier hits were with Scepter Records, his label for six years. He left Scepter Records in 1972 and spent a short period, in 1973 and 1974, with Paramount Records, during which time he released two albums, Songs (1973) and Longhorns & Londonbridges (1974). In 1975, Thomas released the album Reunion on ABC Records, which had absorbed the Paramount label; it contained "(Hey Won't You Play) Another Somebody Done Somebody Wrong Song" (the longest titled No. 1 hit ever on the Hot 100). It was Thomas's first big hit since 1972 and secured him his fourth gold record. In 1976, Thomas released Home Where I Belong, produced by Chris Christian on Myrrh Records, the first of several gospel albums. It was the first Christian album to go platinum, and Thomas became the biggest contemporary Christian artist of the period. On MCA Records, Thomas and Chris Christian recorded what would be his last Top 40 hit single, "Don't Worry Baby", on his last pop album, which also included the Adult Contemporary hit "Still the Lovin' Is Fun". During the 1980s, his success on the pop charts began to wane, but many of his singles reached the upper regions on the country singles chart, including two 1983 chart toppers, "Whatever Happened to Old-Fashioned Love" and "New Looks from an Old Lover" (see 1984 in music), as well as "Two Car Garage", which reached No. 3. In 1981, on his 39th birthday, Thomas became the 60th member of the Grand Ole Opry. Thomas scored another hit, recording "As Long As We Got Each Other", the theme to Growing Pains. The first season theme was a solo for Thomas, but was re-recorded as a duet with Jennifer Warnes for the second and third seasons. It was re-recorded again for the show's fourth season with British singer Dusty Springfield, but the Thomas/Warnes version was reinstated for season five and most of season seven. Thomas first released this track on his 1985 album Throwing Rocks at the Moon (Columbia Records). Thomas has also authored two books including the autobiography Home Where I Belong, and starred in the movies Jory and Jake's Corner. Several commercial jingles including Coca-Cola, Pepsi, and Bell, have featured his singing voice and music. On December 31, 2011, Thomas was the featured halftime performer at the 2011 Hyundai Sun Bowl in El Paso, Texas. On December 3, 2013, the National Academy of Recording Arts and Sciences announced that his 1969 single "Raindrops Keep Fallin' on My Head" would be inducted into the Grammy Hall of Fame. Thomas has been married to singer-songwriter Gloria Richardson since December 1968. They have three daughters: Paige (born 1970), Nora (adopted from Korea in 1978), and Erin (born in 1979). Shortly after Thomas's career began, he became dependent on drugs and alcohol which led to his marriage nearly ending and himself even coming close to death. Gloria became a Christian in 1975, and less than a month later, so did B.J. ; most press sources indicate that Thomas has been sober since their separation was reconciled in 1976. 1995 Precious Memories Warner Bros.
1997 I Believe Warner Bros.
AShining also peaked at No. 17 on the RPM Country Albums chart in Canada. Note: Singles without indicated B-sides may have been only released as promotional copies with stereo and mono versions of the same song. 1966 "I'm So Lonesome I Could Cry"
1967 "I Can't Help It (If I'm Still in Love with You)"
1968 "The Eyes of a New York Woman"
1970 "Everybody's Out of Town"
1971 "No Love At All"
1972 "Rock and Roll Lullaby"
"Happier Than the Morning Sun"
1975 "(Hey Won't You Play) Another Somebody Done Somebody Wrong Song"
"Help Me Make It (To My Rockin' Chair)"
1977 "Home Where I Belong"
"Still The Lovin' Is Fun"
1978 "I Want To Be More Like Jesus"
"Everybody Loves a Rain Song"
1979 "We Could Have Been the Closest of Friends"
1980 "Jesus on My Mind"
"The Faith of a Little Child"
"Everything Always Works Out for the Best"
"Some Love Songs Never Die"
1982 "Satan, You're A Liar"
1983 "Whatever Happened to Old-Fashioned Love"
1984 "The Whole World's in Love When You're Lonely"
"The Girl Most Likely To"
1985 "The Part of Me That Needs You Most"
1989 "Don't Leave Love (Out There All Alone)"
↑ Wirt, John (February 9, 2007). "The music never gets old for Thomas". The Advocate (Online). p. 2. Retrieved 2007-02-20. 1 2 3 4 Murrells, Joseph (1978). The Book of Golden Discs (2nd ed.). London: Barrie and Jenkins Ltd. pp. 213, 250, 268 & 365. ISBN 0-214-20512-6. ↑ Uncredited, Profile of B.J. Thomas Archived March 7, 2016, at the Wayback Machine. ; www.xentel.com. ↑ Gary James, Interview with B.J. Thomas Archived March 3, 2016, at the Wayback Machine., 2005; www.classicbands.com. ↑ Erlewine, Stephen Thomas (2013). "B.J. Thomas The Living Room Sessions". The Living Room Sessions. AllMusic. Retrieved December 3, 2013. 1 2 "2014 Grammy Hall of Fame". Raindrops Keep Fallin' on my Head. The Recording Academy. December 3, 2013. Archived from the original on December 3, 2013. Retrieved December 3, 2013. ↑ "Gloria Thomas". AllMusic. Retrieved August 7, 2014. 1 2 Jenkins, B.J. Thomas as told to Jerry B. (1982). Home where I belong ([Repr.] ed.). Waco, Texas: Word Books. ISBN 0849929059. ↑ "Billy Joe Thomas: From Then to Now". ↑ Kennedy, John W. "Conversation: B.J. Thomas". Archived from the original on March 13, 2014. ↑ Rick, Coates (August 22, 2011). "BJ Thomas". Northern Express. Retrieved August 7, 2014. Recommitting himself to his religious upbringing in 1976 Thomas pursued Christian music, finding success on the charts but challenges on the road. Often blending his concerts with his Christian and pop songs, his secular music didn't sit well with some in the audience. ↑ Howard, Kerbel (August 6, 2014). 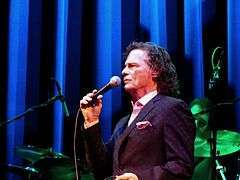 "A Conversation With BJ Thomas: Love, Near Tragedy And A Song That Saved". The Huffington Post. Retrieved August 7, 2014. 1 2 3 4 5 6 7 8 "Awards: B.J. Thomas". Allmusic. Retrieved 19 April 2016. ↑ "Christian CHR National Airplay". The Nielsen Company. Retrieved July 9, 2012. ↑ "The top 20 pop singles, based on Billboard's survey...". UPI. 12 October 1984. Retrieved 19 April 2016. 1 2 "Artist"s Bio: BJ Thomas". Grand Ole Opry. Archived from the original on April 19, 2016. Retrieved 19 April 2016. Wikimedia Commons has media related to B.J. Thomas.